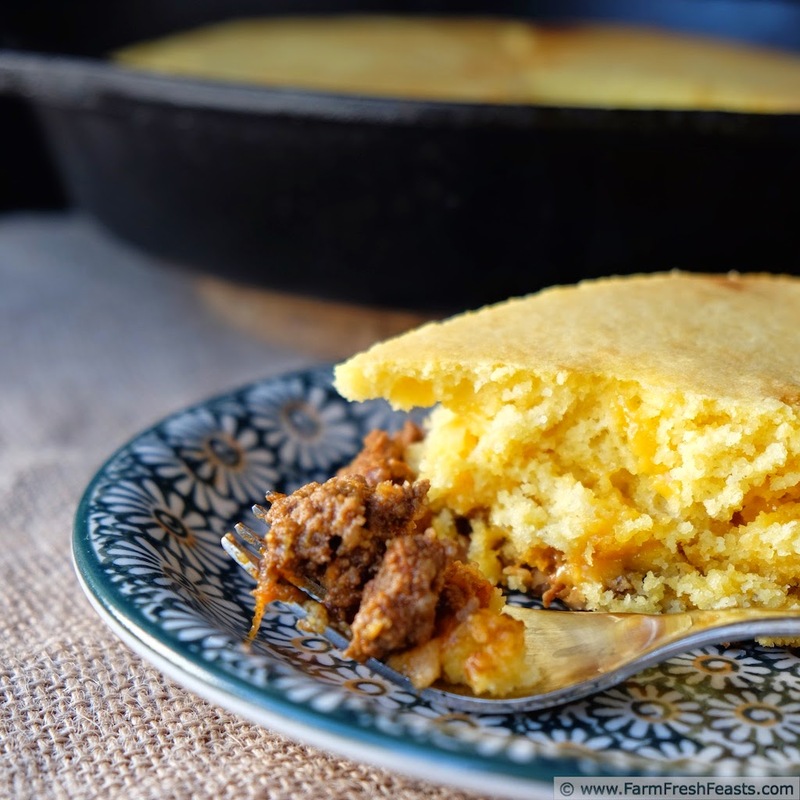 Taco meat, shredded turnips and enchilada sauce make up the filling in this tamale pie. 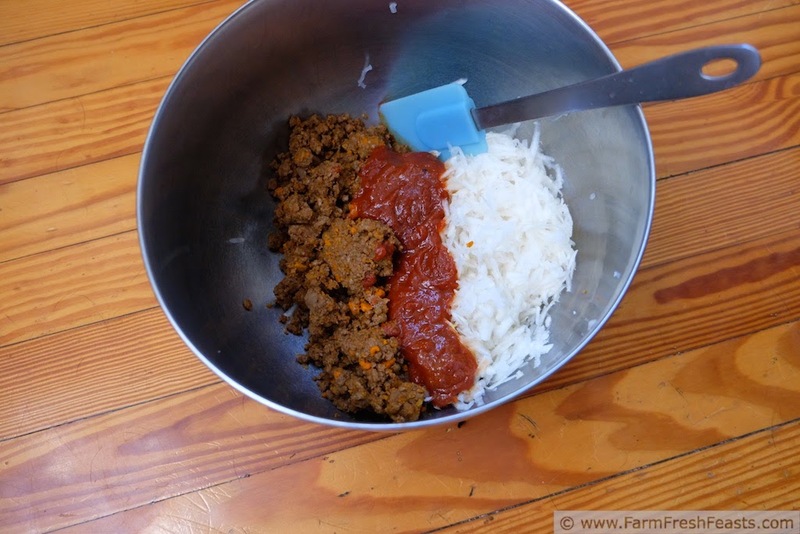 When I first started blogging, about 2ish years ago, I frequently talked about how I add shredded vegetables to stretch a pound of ground meat. I do this in tacos, in burgers, and in meatloaf. The benefits of this technique are twofold: I am boosting the amount of vegetables in my family's diet in ways that my family will eat them [because I'll be honest, the kids are not Open-faced Shaved Beet Sandwich fans] AND I'm using the produce from our farm share in a timely manner. In the long term I want to increase the amount of vegetables we eat [hey, it's part of the reasons we joined a CSA in the first place]. But when I open the fridge and see a crisper full of turnips 2 days before the next farm share pick up, the short term goal of using ALL the produce becomes paramount. I was getting desperate creative, looking for ways to use them, when I came up with this. Normally if I'm clueless about dinner I'll thaw a package of ground beef and make tacos or taco salad. Because I add veggies to the base of meat often, we don't use the whole amount of taco meat and frequently have leftovers. This was a great way to repurpose a leftover and use turnips. I've made root vegetable enchiladas [and need to make the photos of that one prettier], so I know the combo of enchilada sauce + turnip is pleasing to my family. I just pumped it up a bit. This could be another concept recipe--a way to incorporate a variety of Community Supported Agriculture (CSA) farm share vegetables into a dish--like my Fast CSA Greens and Pasta Concept recipe. Just with root vegetables this time. For other tips to feed your family from the farm share, check out this post. For other recipes using turnips, please see my Turnip Recipe Collection, part of the Visual Recipe Index. For other recipes using ground beef, check out this round up of 106 Food Blogger Recipes Using Ground Beef. Note: I thought there was too much cornbread, so the amount shown below is half of what I used in the photos. 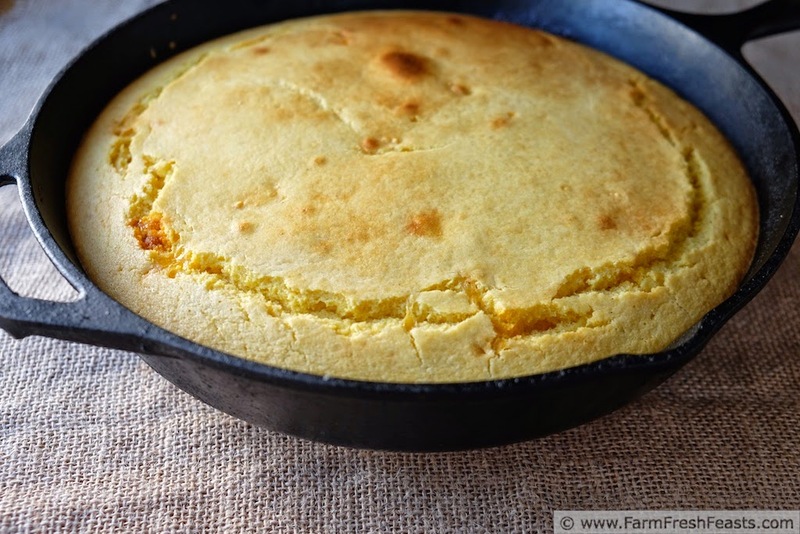 If you prefer a little filling and mostly cornbread, double the egg, buttermilk, cornmeal, etc but keep a cup of corn kernels just because. 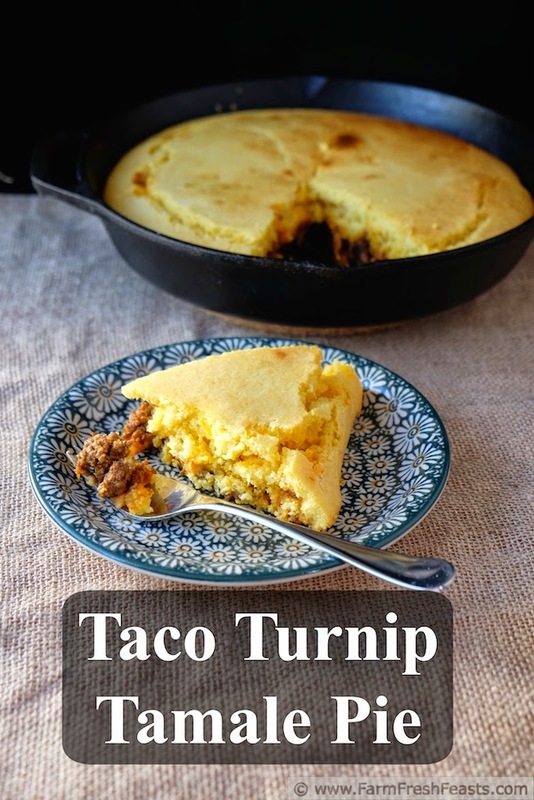 Another Note: This recipe is not gluten free as prepared, because I used taco seasoning and enchilada sauce that contain gluten and my cornmeal was not certified gluten free. To adapt this recipe for a gluten free diet please substitute the taco seasoning and enchilada sauce of your choice, and make sure your cornmeal is from a facility that does not allow cross contamination with wheat. Preheat oven to 425 degrees. In a large bowl mix the first 3 ingredients. 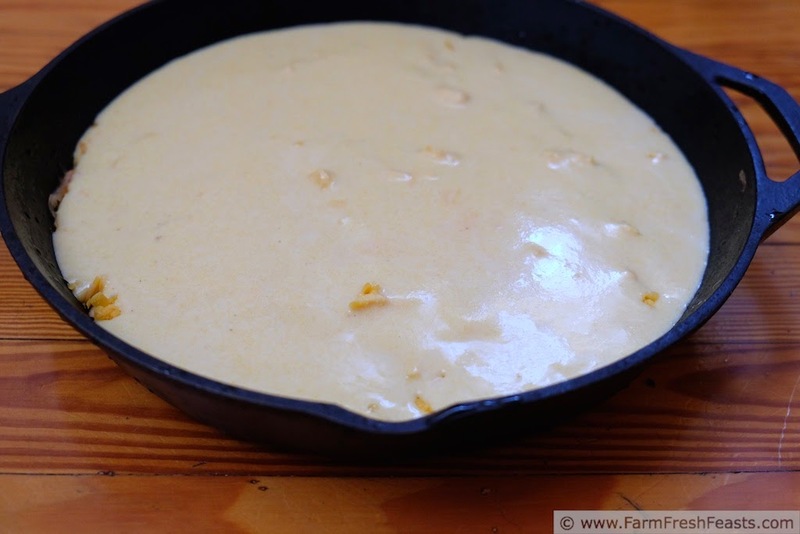 Spread in a 10 inch cast iron skillet or 8 inch square baking pan. Top with cheese. In that same, already dirty, large bowl mix up the rest of the ingredients. Whisk the eggs and buttermilk, then dump the dry ingredients on top. Whisk until the batter is smooth, then stir in the corn kernels. Spread over top of the cheese. Bake for 25 minutes, until top begins to brown. Serve hot. Leftovers reheat well. Come on up to Dayton and I'll . . . no, actually I won't because WE ATE ALL THE FARM SHARE TURNIPS!!! Hooray! 2014 is DONE DONE DONE! Ok, I'm shouting. Sorry. It's quite an accomplishment, you see. Still--I'll take your mushroom kheema! Delicious, nutritious, like Josh Turner's wife's kisses. Ok, that was an obscure reference and I'm going with it. Cute song, BTW. In addition to this I've shredded turnips for fritters--also good. Turnips are so underrated. When I first got turnips in my CSA box 6 years ago I was at a total loss. I've since fallen in love with them. This is a great way to sneak them into dinner to stretch it further. I can't say I've fallen in love with turnips, but we have reached an agreement. I will say I've fallen in love with beet greens. Oh, how I love them. They are the best. 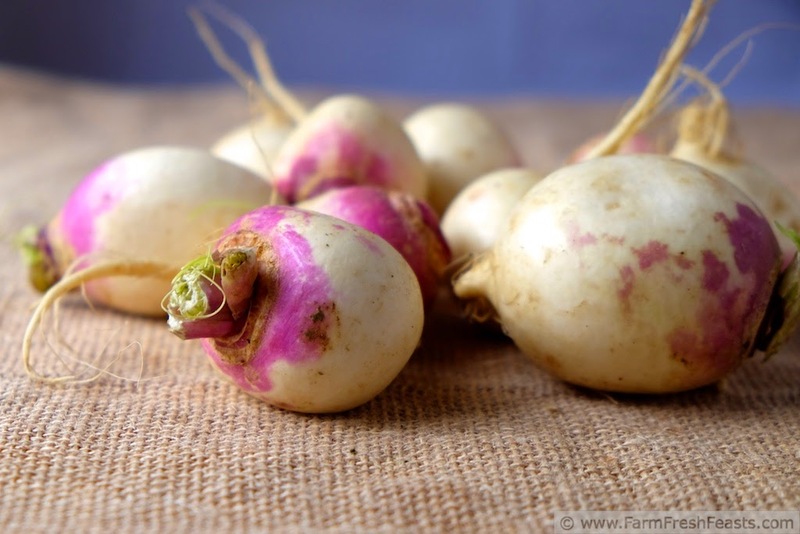 But turnips--I'm glad to get them out of the crisper and into the kids! I love turnips and to think that they can be used for making pies is just amazing. I will definitely give this a try and thanks for sharing. How do you like to use turnips? I'm always looking for new ideas. This looks great. Such a versatile concept too. I'm into root vegetables this year like never before. Suddenly the fridge is full of turnips, rutabaga, parsnips, and parsley root. I need to find some parsley root--I want to try that chicken stock recipe!